It has been said that the difference between the human and the animal is language; it has been said that the difference is shame; it has been said that the difference is the use of tools. But it is the experience of time that separates humanity from all the other living species. Language, shame, even the use of tools, all of these things evolve within the environment of our temporal experience, which allows for planning, for communication based on realities that aren’t necessarily at hand, and, of course, regret. It is this essential time, as an overarching milieu, that Hanne Darboven iterates in “Evolution Leibniz.” And it is through the basic human traits, our shame, our language, our use of tools, that she constructs a philosophy of life, of history. Originally shown in 1986 at the Sprengel Museum in Hanover (and published simultaneously) this seminal work takes as its outward inspiration the 350th anniversary of the death of Gottfried Wilhelm Leibniz. The 444 page volume is constituted by 222 framed double-pages. A second piece, “Dostojeweski” (1990) will accompany the work in the second viewing gallery. With her use of abstracted language (a wavy cursive) and numerical description (“2=1,2;1+1=1,2” seals each image of “Evolution Leibniz”), Darboven fosters an epic impression of memory that is personal, collective and historical. The repeated image of “Evolution Leibniz,” a toy-like model representing a toilet and a figure working a hammer and anvil, encompass a pathos, not only of the mundanity of days and more days, but of a primary awe in our taken-for-granted technologies and mental outlook. 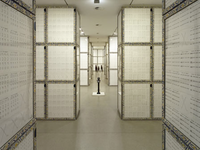 While much has been written of Darboven and the relationship of her work to history and twentieth century philosophy, the projects themselves incorporate a plastic transience, and slide into the future with facility. The computer age, a new scientific era that incorporates chaos and a multiplicity of realities—as these theories develop into philosophies and philosophies of art, Darboven’s creations will persist in their cogency: an eternal immediacy, which for all its complexity, for all its abstraction, is the most fundamental, most animal awareness.